Of course, transformation spells can be used for many different things since the idea of "transformation" is pretty general. I suppose that all spells involve change of some kind, that's their whole purpose. People don't usually cast spells to keep things the way they are. Anyway, here is a good all-purpose transformation spell that you can use to make some changes in your own life. The first part is a little tricky, but you do need to get it right. You need a cup-shaped piece of egg shell to start your seed, so crack an egg carefully so that the top end comes off and you're left with about half an egg shell. Rinse it out gently and sit it out to dry for a few days before continuing. Then use the marker to write a word on the outside of the shell to represent what you want to change. Place the little crystal in the shell. You'll want to use a type of crystal that relates to what you're trying to change (check the crystal chart) or use a plain piece of quartz. Fill the rest of the shell with soil. Press the seed into the soil and keep it moist. 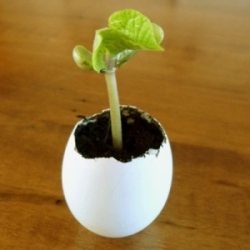 Use a cut piece of egg carton to hold the shell and leave it somewhere sunny. Check the shell every day and take note in your mind as it starts to sprout and changes. Focus on that change and start to make your own changes as it grows. When it outgrows the shell, gently crack the bottom and then replant the whole thing into a larger pot so the plant can keep growing. Your own changes will thrive along with your plant. Other types of transformation spells can be found around the site. Weight loss spells are the most popular ones around here, but I also have a page for improving your overall appearance.